At UMSL, you can have it all. Join our diverse student body and have access to world-class researchers and scholars, top-ranked degree programs and sought-after internship opportunities. In short, you'll receive a serious education at a serious value. It’s no wonder more than 100,000 alumni chose UMSL for their degree. Whether you've set your sights on a professional career path or you'd like to engage in an area of interest, our pre-professional programs are perfect for undergraduate students planning postgraduate studies in law or the health professions. Let our dedicated advisors help you navigate your options. The Honors College at UMSL is an enclave for high-achieving students looking for a supportive atmosphere, both academically and socially. It’s a learning community that offers you dedicated advising, distinct undergraduate research and internship experiences, independent study projects, and a 13:1 student-to-faculty ratio. All adding up to your success in the classroom and beyond. UMSL|NOW brings together more than 50 degree and certificate programs offered in convenient night, online and weekend formats for working adults. It's the same academic rigor as our traditional day programs, but built to provide you with greater flexibility to manage your time and ensure your academic success. UMSL is a vibrant community. 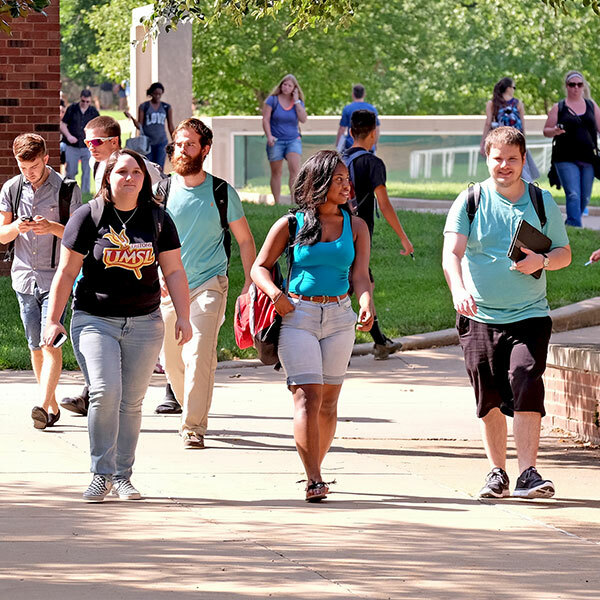 UMSL provides a great environment for students to learn, make friends and explore new interests. With 120+ student organizations, an active Greek Life, work-study opportunities, leadership programs and many events, there is always something to do on campus. And, you'll find a place to call home: Whether you live in a campus apartment or traditional residential hall, living on campus is convenient, fun and a great way to meet people. Schedule a campus tour to see for yourself. The University of Missouri–St. Louis is accredited by the Higher Learning Commission. This accreditation applies to all baccalaureate, masters and doctoral levels.